St. Paul, Minn., April 21, 2017 – PolyMet Mining Corp (“PolyMet” or the “Company”) TSX: POM; NYSE MKT: PLM – today reported that it has filed its financial results for the year ended January 31, 2017. PolyMet controls 100 percent of the development-stage NorthMet copper-nickel-precious metals ore-body and the nearby Erie Plant, located near Hoyt Lakes in the established mining district of the Mesabi Iron Range in northeastern Minnesota. More detail on the status of permit review can be found at: http://polymet.mn.gov/news.html. On March 3, 2016, the state determined that the Final EIS addresses the objectives defined in the EIS scoping review, meets procedural requirements and responds appropriately to public comments. The 30-day period allowed by law to challenge the state’s decision passed without any legal challenge being filed. The Final EIS demonstrates that the NorthMet Project can be constructed and operated in compliance with environmental and human health standards. On June 2, 2016, the Company agreed to issue up to an additional $14.0 million secured non-convertible debentures to Glencore AG, a wholly owned subsidiary of Glencore plc (together “Glencore”), to fund permitting and general corporate purposes. The debentures are on similar terms as the existing non-convertible senior secured debentures. On July 1, 2016, the Company repaid the $4.0 million initial principal loan from the Iron Range Resources and Rehabilitation Board. On July 11, 2016, the Company submitted applications for water-related permits required to construct and operate NorthMet. On July 12, 2016, the Eastern Region Regional Office of the USFS issued its response to comments on the Draft ROD for the land exchange and instructed the Superior National Forest to proceed with completing the Final ROD. On August 2, 2016, the Company renewed its request for Water Quality Certification under Section 401 of the Clean Water Act. On August 24, 2016, the Company submitted the air quality permit application required to construct and operate NorthMet. On September 14, 2016, the Company and Glencore agreed to extend the maturity date of outstanding secured convertible debentures and outstanding secured non-convertible debentures to the earlier of March 31, 2018, availability of $100 million of debt or equity financing, or when it is prudent for the Company to repay the debt. On October 18, 2016, the Company closed the initial tranche of a private placement for gross proceeds of $19.472 million. On October 28, 2016, the Company closed the second tranche of a private placement for gross proceeds of $10.583 million pursuant to Glencore’s right to maintain its pro rata ownership. On November 3, 2016, the Company submitted the Permit to Mine application required to construct and operate NorthMet. On December 15, 2016, the Company received the American Exploration and Mining Association’s Environmental Excellence Award for its responsible development of the NorthMet Project. On December 20, 2016, the Memorandum of Agreement of the Section 106 Consultation under the National Historic Preservation Act was signed by the statutory parties. On January 9, 2017, the USFS issued its Final ROD authorizing the land exchange. 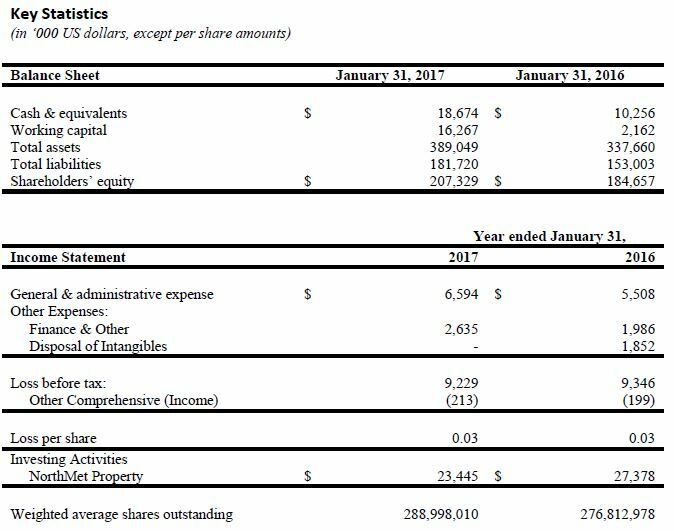 Loss for the twelve months ended January 31, 2017, was $9.229 million compared with $9.346 million for the prior year period. Excluding non-cash compensation and amortization, general and administrative expenses for the twelve months ended January 31, 2017, were $4.786 million compared with $5.051 million for the prior year period. At January 31, 2017, PolyMet had cash of $18.674 million compared with $10.256 million at January 31, 2016. PolyMet invested $23.445 million cash into its NorthMet Project during the twelve months ended January 31, 2017, compared with $27.378 million in the prior year period. As of January 31, 2017, PolyMet had spent $117.872 million on environmental review and permitting, of which $111.421 million has been spent since the NorthMet Project moved from exploration to development stage. Completing the approved land exchange with the USFS and transferring of title to the surface rights over and around the NorthMet mineral rights to PolyMet. Obtaining a decision by the state on 401 Water Quality Certification and U.S. Army Corps of Engineers Final ROD and 404 wetlands permit under the Clean Water Act. Publication of draft state permits (Permit to Mine, air, water, dam safety and water appropriation permits) for public comment. Decisions on state permit issuances. Repayment, restructuring, and/or conversion of Glencore loans. Specific reference is made to PolyMet’s most recent Annual Information Form for the fiscal year ended January 31, 2017 and in our other filings with Canadian securities authorities and the U.S. Securities and Exchange Commission, including the Company’s Form 40-F, for a discussion of some of the risk factors and other considerations underlying forward-looking statements. The Annual Information Form contains the Company’s mineral resource and other data as required under National Instrument 43-101.